Saint Teresa of Ávila, born Teresa Sánchez de Cepeda y Ahumada, also called Saint Teresa of Jesus (28 March 1515 – 4 October 1582), was a Spanish noblewoman with Jewish roots who chose a monastic life in the Roman Catholic church. A Carmelite nun, prominent Spanish mystic, religious reformer, author, theologian of the contemplative life and mental prayer, she earned the rare distinction of being declared a Doctor of the Church over four centuries after her death. Active during the Counter-Reformation, she reformed the Carmelite Orders of both women and men. The movement she initiated was later joined by the younger Spanish Carmelite friar and mystic, Saint John of the Cross. It led eventually to the establishment of the Discalced Carmelites. A formal papal decree adopting the split was issued in 1580. Teresa Sánchez de Cepeda y Ahumada was born in 1515 in Ávila, Spain. Her paternal grandfather, Juan Sánchez de Toledo, was a marrano or Converso, a Jewish man who was forced to convert to Christianity. When Teresa's father was a child, Juan was condemned by the Spanish Inquisition for allegedly returning to the Jewish faith, but he was later able to assume a Catholic identity. Her father, Alonso Sánchez de Cepeda, was a successful wool merchant and one of the wealthiest men in Ávila. He father bought a knighthood and was successfully assimilated into Christian society. Previously married to Catalina del Peso y Henao, with whom he had three children, in 1509, Sánchez de Cepeda married Teresa's mother, Beatriz de Ahumada y Cuevas, in Gotarrendura. Teresa's mother was keen to raise her daughter as a pious Christian. Teresa was fascinated by accounts of the lives of the saints and ran away from home at age seven with her brother Rodrigo to find martyrdom among the Moors. Her uncle stopped them on the road as he was returning to the town, having spotted them outside the town walls. When Teresa was eleven years old, her mother died, leaving her grief-stricken. This prompted her to embrace a deeper devotion to the Virgin Mary as her spiritual mother. Teresa was also enamored of popular fiction, which, at the time was primarily medieval tales of knighthood and works about fashion, gardens and flowers. Teresa was sent to the Augustinian nuns' school at Ávila. After completing her education, she initially resisted the idea of a religious vocation, but after a stay with her uncle and other relatives, she relented. In 1536 aged 18, much to the disappointment of her pious and austere father, she decided to enter the local easy-going Carmelite Convent of the Incarnation, significantly built on top of land that had been used previously as a burial ground for Jews. She took up religious reading on contemplative prayer, especially Osuna’s Third Spiritual Alphabet (1527). Her zeal for mortification caused her to became ill again and she spent almost a year in bed, causing huge worry to her community and family. She nearly died but, she recovered thanks to the miraculous intercession of St. Joseph, she believed. She began to experience instances of religious ecstasy. Her reading of medieval mystics, consisted of directions for examinations of conscience and for spiritual self-concentration and inner contemplation known in mystical nomenclature as oratio recollectionis or oratio mentalis. She also dipped into other mystical ascetic works such as the Tractatus de oratione et meditatione of Saint Peter of Alcantara, and perhaps some upon which Saint Ignatius of Loyola based his Spiritual Exercises—possibly the Spiritual Exercises themselves. She reported that, during her illness, she had risen from the lowest stage, "recollection", to the "devotions of silence" or even to the "devotions of ecstasy", which was one of perfect union with God (see § Mysticism). During this final stage, she said she frequently experienced a rich "blessing of tears". As the Catholic distinction between mortal and venial sin became clear to her, she came to understand the awful terror of sin and the inherent nature of original sin. She also became conscious of her own natural impotence in confronting sin and the necessity of absolute subjection to God. The memory of this episode served as an inspiration throughout the rest of her life, and motivated her lifelong imitation of the life and suffering of Jesus, epitomized in the adage often associated with her: "Lord, either let me suffer or let me die." Teresa who became a celebrity in her town dispensing wisdom from behind the convent grille, was also known for her raptures which sometimes involved levitation. It was a source of embarrassment to her and she bade her sisters hold her down when this occurred. Subsequently, historians and neurologists and psychiatrists like, Peter Fenwick and Javier Alvarez-Rodriguez among others, have taken an interest in her symptomatology. The fact that she wrote down virtually everything that happened to her during her religious life, means that an invaluable and exceedingly rare medical record from the 16th-century has been preserved. Examination of this record has led to the speculative conclusion that she may have suffered from Temporal lobe epilepsy. Over time, Teresa found herself increasingly at odds with the spiritual malaise prevailing in her convent of the Incarnation. Among the 150 nuns living there, the observance of cloister, designed to protect and strengthen spiritual practice and prayer, became so lax that it appeared to lose its purpose. The daily invasion of visitors, many of high social and political rank, disturbed the atmosphere with frivolous concerns and vacuous conversation. Such intrusions in the solitude essential to develop and sustain contemplative prayer so grieved Teresa that she longed to intervene. The incentive to take the practical steps inspired by her inward motivation was supported by the Franciscan priest, Saint Peter of Alcantara, who met her early in 1560 and became her spiritual adviser. She resolved to found a "reformed" Carmelite convent, correcting the laxity which she had found at the Incarnation convent and elsewhere besides. Guimara de Ulloa, a woman of wealth and a friend, supplied the funds for the project. The abject poverty of the new convent, established in 1562 and named St. Joseph's (San José), at first caused a scandal among the citizens and authorities of Ávila, and the small house with its chapel was in peril of suppression. However powerful patrons, including the local bishop, coupled with the impression of well ordered subsistence and purpose, turned animosity into approval. In March 1563, after Teresa had moved to the new convent house, she received papal sanction for her primary principles of absolute poverty and renunciation of ownership of property, which she proceeded to formulate into a "constitution". Her plan was the revival of the earlier, stricter monastic rules, supplemented by new regulations including the three disciplines of ceremonial flagellation prescribed for the Divine Office every week, and the discalceation of the religious. For the first five years, Teresa remained in seclusion, mostly engaged in prayer and writing. In 1567, Teresa received a patent from the Carmelite General, Rubeo de Ravenna, to establish further houses of the new order. This process required many visitations and long journeys across nearly all the provinces of Spain. She left a record of the arduous project in her Libro de las Fundaciones. Between 1567 and 1571, reformed convents were established at Medina del Campo, Malagón, Valladolid, Toledo, Pastrana, Salamanca, and Alba de Tormes. As part of the original patent, Teresa was given permission to set up two houses for men who wished to adopt the reforms. She convinced two Carmelite friars, John of the Cross and Father Anthony of Jesus to help with this. They founded the first monastery of Discalced Carmelite brothers in November 1568 at Duruelo. Another friend of Teresa, Jerónimo Gracián, the Carmelite visitator of the older observance of Andalusia and apostolic commissioner, and later provincial of the Teresian order, gave her powerful support in founding monasteries at Segovia (1571), Beas de Segura (1574), Seville (1575), and Caravaca de la Cruz (Murcia, 1576). Meanwhile, John of the Cross promoted the inner life of the movement through his power as a teacher and preacher. In 1576, unreformed members of the Carmelite order began to persecute Teresa, her supporters and her reforms. Following a number of resolutions adopted at the general chapter at Piacenza, the governing body of the order forbade all further founding of reformed convents. The general chapter instructed her to go into "voluntary" retirement at one of her institutions. She obeyed and chose St. Joseph's at Toledo. Meanwhile her friends and associates were subjected to further attacks. Several years later, her appeals by letter to King Philip II of Spain secured relief. As a result, in 1579, the cases before the inquisition against her, Father Gracian and others, were dropped. This allowed the reform to resume. An edict from Pope Gregory XIII allowed the appointment of a special provincial for the newer branch of the Carmelite religious, and a royal decree created a "protective" board of four assessors for the reform. During the last three years of her life, Teresa founded convents at Villanueva de la Jara in northern Andalusia (1580), Palencia (1580), Soria (1581), Burgos, and Granada (1582). In total, seventeen convents, all but one founded by her, and as many men's monasteries were owed to her reforms over twenty years. Her final illness overtook her on one of her journeys from Burgos to Alba de Tormes. She died in 1582, just as Catholic Europe was making the switch from the Julian to the Gregorian calendar, which required the excision of the dates of 5–14 October from the calendar. She died either before midnight of 4 October or early in the morning of 15 October which is celebrated as her feast day. According to the liturgical calendar then in use, she died on the 15th. Her last words were: "My Lord, it is time to move on. Well then, may your will be done. O my Lord and my Spouse, the hour that I have longed for has come. It is time to meet one another." She was buried at the Convento de la Anunciación in Alba de Tormes. Nine months after her death the coffin was opened and her body was found to be intact but the clothing had rotted. Before the body was re-interred one of her hands was cut off, wrapped in a scarf and sent to Ávila. Father Gracián cut the little finger off the hand and - according to his own account - kept it with him until it was taken by the occupying Ottoman Turks, which he had to redeemed it with a few rings and 20 reales. The body was exhumed again on 25 November 1585 to be moved to Ávila and found to be incorrupt. An arm was removed and left in Alba de Tormes at the nuns' request, to compensate for losing the main relic of Teresa, but the rest of the body was reburied in the Discalced Carmelite chapter house in Ávila. The removal was done without the approval of the Duke of Alba de Tormes and he brought the body back in 1586, with pope Sixtus V ordering that it remain in Alba de Tormes on pain of excommunication. A grander tomb on the original site was raised in 1598 and the body was moved to a new chapel in 1616. The first, Devotion of the Heart, consists of mental prayer and contemplation. It means the withdrawal of the soul from without, penitence and especially the devout meditation on the passion of Christ (Autobiography 11.20). The second, Devotion of Peace, is where human will is surrendered to God. This occurs by virtue of an uplifted awareness granted by God, while other faculties, such as memory, reason, and imagination, are not yet safe from worldly distraction. Although a partial distraction can happen, due to outer activity such as repetition of prayers or writing down spiritual things, the prevailing state is one of quietude (Autobiography 14.1). The third, Devotion of Union, concerns the absorption-in-God. It is not only a heightened, but essentially, an ecstatic state. At this level, reason is also surrendered to God, and only the memory and imagination are left to ramble. This state is characterized by a blissful peace, a sweet slumber of at least the higher soul faculties, that is a consciousness of being enraptured by the love of God. The fourth, Devotion of Ecstasy, is where the consciousness of being in the body disappears. Sensory faculties cease to operate. Memory and imagination also become absorbed in God, as though intoxicated. Body and spirit dwell in the throes of exquisite pain, alternating between a fearful fiery glow, in complete unconscious helplessness, and periods of apparent strangulation. Sometimes such ecstatic transports literally cause the body to be lifted into space. This state may last as long as half an hour and tends to be followed by relaxation of a few hours of swoon-like weakness, attended by the absence of all faculties while in union with God. The subject awakens from this trance state in tears. it may be regarded as the culmination of mystical experience. Indeed, Teresa was said to have been observed levitating during Mass on more than one occasion. Teresa is regarded as one of the foremost writers on mental prayer, and her position among writers on mystical theology as unique. Her writings on this theme, stem from her personal experiences, thereby manifesting considerable insight and analytical gifts. Her definitions have been used in the Catechism of the Catholic Church. Teresa states: "Contemplative prayer, oración mental, in my opinion is nothing other than a close sharing between friends. It means frequently taking time to be alone with Him whom we know loves us." Throughout her writings, Teresa returns to the image of watering one's garden as a metaphor for mystical prayer. Teresa's writings are regarded as among the most remarkable in the mystical literature of the Catholic Church. Two smaller works are the Conceptos del Amor ("Concepts of Love") and Exclamaciones. In addition, there are Las Cartas (Saragossa, 1671), or her correspondence, of which there are 342 extant letters and 87 fragments of others. 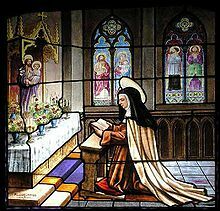 St Teresa's prose is marked by an unaffected grace, an ornate neatness, and charming power of expression, together placing her in the front rank of Spanish prose writers. Her rare poems ("Todas las poesías", Munster, 1854) are distinguished for tenderness of feeling and rhythm of thought. Christia Mercer, Columbia University philosophy professor, claims that the seventeenth-century Frenchman, René Descartes, lifted some of his most influential ideas from Teresa of Ávila, who, fifty years before Descartes, wrote popular books about the role of philosophical reflection in intellectual growth. She describes a number of striking similarities between Descartes' seminal work Meditations on First Philosophy and Teresa's Interior Castle. Saint Teresa, who reported visions of Jesus and Mary, was a strong believer in the efficacy of holy water, claiming to have used it with success to repel evil spirits and temptations. She wrote: "I know from frequent experience that there is nothing which puts devils to flight better than holy water." The Spanish nuns who established Carmel in France brought a devotion to the Infant Jesus with them, and it became widespread in France. Indeed, one of Teresa's most famous later followers, Saint Thérèse of Lisieux (1875-1898), a French Carmelite, herself named for Teresa, took as her religious name Sister Thérèse of the Child Jesus and the Holy Face. Though there are no written historical accounts establishing that Teresa of Ávila ever owned the famous Infant Jesus of Prague statue, according to tradition, such a statue is said to have been in her possession and Teresa is reputed to have given it to a noblewoman travelling to Prague. The age of the statue dates to approximately the same time as Teresa. It has been thought that Teresa carried a portable statue of the Child Jesus wherever she went, the idea circulated by the early 1700s. Marc-Antoine Charpentier composed two motets for the feast of Saint Teresa: Flores, flores o Gallia for two voices and two flutes (H 374), c. 1680 and the other, for two high voices, one bass and Bass continuo (H 342), in 1686. Saint Teresa is a track on Joan Osborne's Relish album, nominated for a Grammy Award in 1996. Teresa was the subject of a portrait by the Flemish master, Sir Pieter Paul Rubens (1615) now in the collection of the Kunsthistorisches Museum, Vienna. Teresa de Jesús (1984), directed by Josefina Molina and starring Concha Velasco, is a Spanish made for TV mini-series. In it Teresa is portrayed as the determined foundress of new carmelite houses while protecting the infant Jesus statue on her many arduous journeys. The devotion to the Child Jesus spread quickly in Spain, possibly due to her mystical reputation and then to other places, including France. Nigel Wingrove's 1989 short film Visions of Ecstasy was based on Teresa of Ávila. The film features phantasied sexualised scenes of Teresa with the body of Jesus on the cross. It is the only work to be refused certification by the British Board of Film Classification (BBFC) on the grounds of blasphemy. Dževad Karahasan. The Delighted Angel drama about Teresa of Ávila and Rabija al-Adavija, Vienna-Salzburg-Klagenfurt, ARBOS 1995. ^ As of 2019, there are 36 "Doctors of the Church", of whom only four are women. ^ Pope John Paul II addressing pilgrims from Avila at the Vatican on 8 October 1981. ^ Rowan Williams (2004). Teresa of Avila. Continuum Compact Series Outstanding Christian Thinkers (reprint ed.). Bloomsbury Publishing. p. 230. ISBN 9780826473417. Retrieved 2019-04-14. ^ Schillinger Liesl (26 December 1999). "The Original Flying Nun - Review of Cathleen Medwick's Teresa of Avila: The Progress of a Soul. Knopf". New York Times. Retrieved 2019-04-14. ^ Stephen Clissold (1982). St. Teresa of Avila (2 ed.). London: Sheldon. ISBN 0 85969 347 3. ^ Stephen Clissold (1982). St. Teresa of Avila (2 ed.). London: Sheldon. ^ Marcella Biro Barton (1982). “Saint Teresa of Avila: Did she have Epilepsy?”, The Catholic Historical Review. Vol. LXVIII, no.4. ^ Javier Alvarez Rodriguez (2007). Epilepsy and Mysticism. pp. 59–69. Retrieved 11 April 2019. ^ Kavanaugh, Kieran (1991). "General Introduction: Biographical Sketch". In Kieran Kavanaugh (ed.). The Collected Works of St John of the Cross. Washington: ICS Publications. pp. 9–27. ISBN 0-935216-14-6. ^ a b c d Kavanaugh, Kieran (1991). "General Introduction: Biographical Sketch". In Kieran Kavanaugh (ed.). The Collected Works of St John of the Cross. Washington: ICS Publications. pp. 9–27. ISBN 978-0-935216-14-1. ^ a b Clissold Stephen (1982). St Teresa of Avila. London: Sheldon Press. pp. 63–64. ISBN 0 85969 347 3. ^ "Catechism of the Catholic Church". 1997. ^ Mercer lays out her case in the journal of Philosophical Studies. Mercer, Christia (2017). "Descartes' debt to Teresa of Ávila, or why we should work on women in the history of philosophy". Philosophical Studies. 174 (10): 2539–2555. doi:10.1007/s11098-016-0737-9. ^ Lafferty, R.A. (1969). Fourth Mansions. New York: Ace Publishing Company. ^ storyline of the Findley novel. ^ "Visions of Ecstasy gets UK rating after 23 year ban". BBC News. Retrieved 2012-01-31. 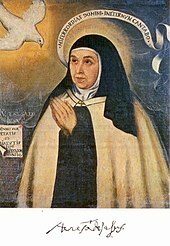 Teresa, of Avila (1957). Cohen, J.M. (ed.). The Life Of Saint Teresa Of Avila By Herself. Penguin Classics. The Complete Works of St Teresa of Jesus, in five volumes, translated and edited by E. Allison Peers, including 2 volumes of correspondence. London: Sheed and Ward, 1982. Balltondre Pla, Mónica (2012). Extasis y visiones: La experiencia contemplativa de Teresa de Ávila (Pensamiento del Presente). Erasmus. ISBN 9788492806980. Zimmerman, Benedict (1912). "St. Teresa of Jesus" . In Herbermann, Charles (ed.). Catholic Encyclopedia. 14. New York: Robert Appleton Company. Bárbara Mujica, Teresa de Ávila: Lettered Woman, (Nashville, Vanderbilt University Press, 2009). John Thomas, "Ecstasy, art & the body. St. Teresa of Avila's 'Transverberation', and it depiction in the sculpture of Gianlorenzo Bernini" in John Thomas, Happiness, Truth & Holy Images. Essays of Popular Theology and Religion & Art (Wolverhampton, Twin Books, 2019), pp. 12–16. John Thomas, "Architectural image and via mystica. St. Teresa's Las Moradas", in John Thomas, Happiness, Truth & Holy Images. Essays of Popular Theology and Religion & Art (Wolverhampton, Twin Books, 2019), pp. 39–48.